With such a globalized world as the one we live in, any single event that occurs in a concrete country can have a profound impact towards the economy of another country located many km away. Without any doubt, the abandonment of a member of the EU of it constitutes a remarkable fact. Like this, the Brexit case created great implications for the rest of the European economies, in which the Spanish one is included. 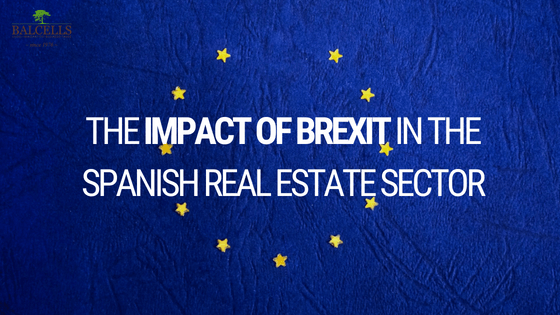 In this article, we will discover the impact of the Brexit in the Spanish real estate sector as long as in the mortgage rates. The British population voted to leave the EU in a landmark decision that took place almost 2 years ago. Since then, the impact on the Spanish Real Estate sector market has been noticeable. The British are by far the largest group of foreign buyers within Spain. And, ever since, there was a downward trend in their operating activity within the Spanish territory, due to the economic consequences that the Brexit involves. After a situation characterized by political instability and uncertainty towards the future economic prosperity, the reasonable choice that the investor embarks on is to wait. Operating this way, the agent will decide not investing his capital abroad, waiting until the mid and long run, when he can see things much more clearly and increase profitability by reducing risks. Nevertheless, we have been experiencing noteworthy growth in the tenement industry recently after a sustained drop during the last year. In the last quarter of 2017, the demand started growing again in a remarkable way. This is due to the fall of the Spanish mortgage rates (-0.191), which had been falling in a constant way during a long period of time, and which are expected to remain in this situation in the near future. Adding to that, prices for the properties are also on an upswing, as investments flood back in. More and more people are investing every day. This is the ideal time to invest in this market to take advantage of the low mortgage rate and to beat the Brexit date. Just like we mentioned in a previous post, given the growth situation and the boom of this Spanish sector, today we are in front of the best moments to invest in Catalonia, especially in the real estate sector. If you have any doubt about the Spanish real estate industry (contracts, buying process, due of diligence, taxes and payments), do not hesitate to contact us to let us solve any doubt you may need to resolve!